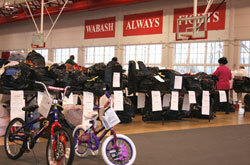 Wabash College’s Knowling Fieldhouse is the site this week for Santa’s elves to organize the big guy's gift bags. Staff members and volunteers for the Montgomery County Youth Services Bureau are organizing and distributing gift bags this week for the community "Reindear" program. The program coordinates charitable Christmas drives like the "Angel Tree." The YSB elves had plenty of work. 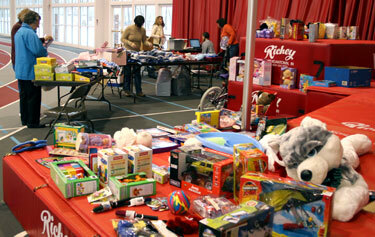 More than 1,200 Montgomery County children will be receiving gifts this year. Youth Services Bureau director David Johnson speaks glowingly of his volunteers and staff but also about the community’s willingness to share the holidays with those less fortunate. "First of all more than 1,200 children were adopted," he said. "That means one out of about every 8 kids in the county." The program faced a challenge last week when more than 100 names were returned to the bureau. The YSB contacted local media to let the community know more children needed adopted. The community stepped up by taking names and making contributions, he said. Johnson explained that volunteer Terra Seidel started the coordination program two years ago. "It allows us to have a centralized point to make it more efficient and to cut down on duplication," Johnson explained. "Reindear allows us, to first of all, do a little bit of checking to see if the families are really needs and to cut down and even eliminate duplication." Seidel noted early on that multiple programs led to inequities, Johnson explained. One child might receive 10 gifts while another might get only two or three. The Reindeer program asks parents and children to list thee ‘wants,’ such as toys or games, and three ‘needs,’ like clothing. "So it’s not just fluff stuff we’re giving them," he said. "We’re helping keep kids warm and healthy." The gifts are organized for parents to pick up and have ready on Christmas morning. Wabash serves as a central point for the organization work and distribution. Tennis coach and Allen Center facilities manager Jason Hutchison assisted the volunteers with their work in Knowling. He also put out a call to students to assist.